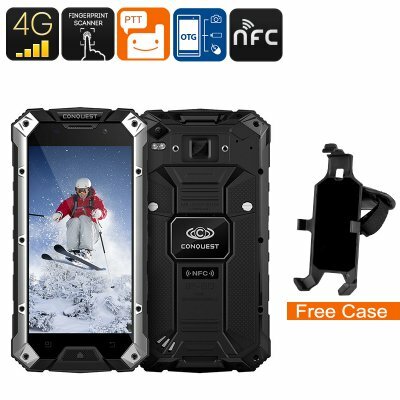 Successfully Added Conquest S6FP Rugged Android Phone - IP68, Quad-Core CPU, 3GB RAM, Gorilla Glass, 5 Inch Display, OTG, NFC (Black / Silver) to your Shopping Cart. For all outdoor enthusiasts that enjoy being out in nature yet like to be connected to the outside world at any time possible there is the Conquest S6FP smartphone. This fully rugged phone holds an IP68 rating making it resistant against water, dust, and shocks. From now on you can head out on your next outdoor adventure with confidence and enjoy the features of your smartphone at any time as this rugged phone is guaranteed to keep up with the harshest environments. Featuring 4G and Dual-IMEI numbers you can be assured that, where ever you are, you can always stay connected to your friends and family back home. With its 5 Inch HD IPS display the Conquest S6FP provides you with a high range of colors and extremely clear and detailed images. Bring media to life in the palm of your hand and enjoy a true cinematic experience – thanks to its Mali-T720 graphics unit this Chinese smartphone is capable of playing HD movies and the newest games without any trouble. Additionally, its Quad-Core CPU that has been clocked at 1.3GHz along with 3GB of RAM provide you with the hardware needed to smoothly enjoy the latest movies, games, apps and more that can be freely downloaded in the Google Play store. Its android operating system is guaranteed to deliver a solid user experience without any lag. Holding 32GB of internal memory that can additionally be upgraded by an extra 32GB or external storage space ensure that, with this Android phone, you don’t have to worry about running out of storage space for all your favorite files and music. Featuring NFC the Conquest S6FP further enhances your user experience by allowing you to easily transfer files in between devices without the need of any external cables. Equipped with an epic 6000mAh battery this Android device delivers a stunning 16 hours of continuous usage time. The next time you head out into the wild there is no need to worry about battery life as this powerful rugged phone can last up to 480 hours on standby mode before running out of juice. Coming with a whole lot of sensors, SOS feature, and stunning 13MP camera the Conquest S6FP smartphone is the perfect device to have at your side during your next outdoor adventure. Additionally, this Chinese phone is great to have at hand during everyday life as well due to the fact that it features powerful hardware and amazing specs that let you enjoy this smartphone and all its features to the absolute most. The Conquest S6FP comes with a 12 months warranty, brought to you by the leader in Android smartphones as well as wholesale electronic gadgets..